Attention, libation lovers: Middle-aged women who indulge in just a few alcohol-containing drinks each day may have a higher risk of cancer than those who drink less often, according to a report released Tuesday in the Journal of the National Cancer Institute. TUESDAY, Feb. 24, 2009 (Health.com) — Attention, libation lovers: Middle-aged women who indulge in just a few alcohol-containing drinks each day may have a higher risk of cancer than those who drink less often, according to a report released Tuesday in the Journal of the National Cancer Institute. Although moderate drinking—considered one drink a day for women, two drinks a day for men—is thought to lower the risk of heart attack and stroke versus both teetotaling and heavy drinking, the study highlights that alcohol has risks as well, and those risks increase in tandem with intake. Compared to those who consumed only a drink or two a week, the cancer risk rose with each additional daily drink, and it was higher for those who consumed 15 or more drinks per week (or more than two drinks a day) than those who said they consumed between seven and 14 drinks per week (or between one and two drinks per day). Overall, nearly 13% of the UK’s cases of these types of cancer in women may be caused by alcohol, and the type—beer, wine, or mixed drinks—doesn’t seem to matter, the researchers conclude. In the study, about 1.3 million women, with an average age of 55, who visited UK breast cancer screening clinics between 1996 to 2001 answered a variety of questions, including the type and frequency of alcohol consumption, smoking, body mass index, exercise, and use of oral contraceptives and hormone replacement therapy. Next page: Were some women binge drinking? Michael S. Lauer, MD, director of the Division of Prevention and Population Sciences at the National Heart, Lung, and Blood Institute in Bethesda, Md., notes that the study does have some limitations. “We have no way of knowing how much alcohol these women actually drank. We only know what they told us,” says Dr. Lauer, who wrote an editorial accompanying the study. “This is an observational study, this is not an experiment.” In addition, it’s not clear how many of the women drank in moderation or were binge drinking. Susan M. Gapstur, PhD, vice president of epidemiology for the American Cancer Society, says women who are concerned about both heart health and their risk of cancer risk should discuss the potential pros and cons with a health care provider. "Researchers remain concerned about the pattern of consumption," says Gapstur. 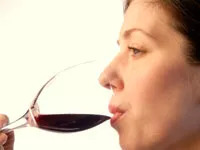 "It is unclear, for example, whether someone who drinks several glasses of wine on one day during the week has the same risk as someone who drinks one glass of wine per day with a meal." The American Cancer Society and the American Heart Association currently recommend that if you do decide to drink, you should do so in moderation, meaning one drink (12 oz. beer, 4 oz. of wine, 1.5 oz. of 80-proof spirits, or 1 oz. of 100-proof spirits) per day for women and two for men.